Rosaliac Cc Cream Review (2018): Is It Really Worth Buying? La Roche-Posay Rosaliac CC Cream Review: Is This Moisturizer Safe To Use? This Rosaliac CC Cream from La Roche-Posay is said to work as a foundation, moisturizer, sunblock, and primer all in one product. It is meant to provide coverage, nourishment, and protection for the skin. This Rosaliac CC moisturizing Cream review will help you weigh whether or not this cc cream is suitable for your beauty needs. About Rosaliac CC Cream – Does It Really Work? La Roche-Posay Rosaliac CC Cream is manufactured by the company La Roche-Posay, named after the French town where it was first discovered. The town is the source of a signature thermal spring water used to treat chronic skin diseases in European hospitals since 1905. This thermal water, known for its antioxidants and healing power, is the foundation of the La-Roche Posay brand we know today. The company produces excellent skin care products clinically tested in a French dermatological laboratory. Clinically tested safe and effective nourishing formula. Provides instant, complete coverage for redness. Protects from the sun’s harmful rays through its SPF 30. Suitable for all skin types ranging from light to medium skin tones. Can be layered with other products such as the Rosaliac AR. Easy to apply and absorbs well into the skin for a lightweight, flawless finish. Helps fight free radical damage. Safe enough for daily use. Light to medium skin with visible redness. What Are The Ingredients In Rosaliac CC Cream? Glycerin: a humectant that attracts water molecules from the environment to increase the moisture levels on the skin’s surface. It also helps balance skin hydration and retains moisture. Ambophenol: this is a natural extract derived from plants that are rich in blendable universal pigments and polyphenols which help soothe irritation and redness. Tocopheryl Acetate: this ingredient is a form of Vitamin E, a powerful antioxidant that aids in protecting the skin from sun damage and fights against free radical formation. Shea Butter extract: this substance is a moisturizing ingredient that nourishes the skin by providing the necessary natural vitamins and fatty acids. It is a known remedy for dry skin and helps improve the production and quality of natural skin oils. Octisalate, Octinoxate, Octocrylene, and Titanium dioxide: all of these provide the sunscreen effect and the SPF 30 to shield the skin from UVA and UVB rays from the sun. 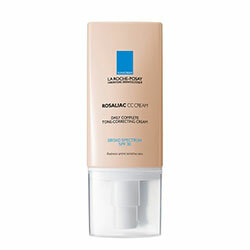 After washing and cleansing the face in the morning, apply the La Roche-Posay Rosaliac CC Cream all over the whole face. This product can be used to replace your daytime foundation and moisturizer. It can also be layered over Rosaliac AR anti-redness serum and can be worn with makeup. Blends and absorbs easily into the skin for a lightweight finish. Covers and minimizes inflammation, irritation, and redness. Suitable for all skin tones and skin types ranging from mature, dry, sensitive, oily, and combination to normal skin. Evens out the skin tone for a natural-looking flawless appearance. Does not emphasize fine lines or large pores. Is not too greasy or oily, unlike most sunscreen/moisturizer/foundation products. Some users complain that this is just a tinted sunscreen rather than a CC cream that the manufacturer claims it to be. It is only available in a single, orange-y shade even though the company insists that it works for all skin tones. The coverage is too thin for some people. It has a strong perfume smell that some customers do not like as it may irritate the skin and lungs. Sometimes turns cakey and greasy. Does Rosaliac CC Cream Have Any Side-effects? As of now, there are no clinical studies to report any Rosaliac CC cream side effects. It is worth noting, however, that some users of the product experienced irritation and acne breakouts upon using the CC cream. The sunscreen ingredients may also be too harsh for sensitive skin types. In conclusion, the Rosalia CC Cream by La Roche-Posay is a great idea for an all-in-one beauty cream. However, the blend of individually potent ingredients and the single available shade defeats the manufacturer’s claim that the product is suitable for all skin types and skin tones.